– The project I worked on since 2016 is being called the Delfia 1* (Delfia One Star). This is a project I worked on for Delft University of Technology, Faculty of 3me department of Marine and Transport Technology. The Delfia1* is a small vessel with multiple sensors and propulsion possibilities. 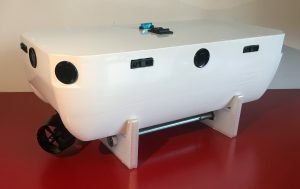 The vessel is developed to sail around fully autonomous. The purpose of this vessel is to validate and test algorithms designed by the department. 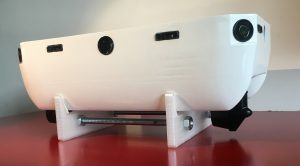 In the second quarter of 2016 I started the project after the year before I made a simplified prototype (Delfia1) to test the working principle. In this version (Star version) I changed the complete vessel, added multiple sensors, changed the layout and improved the overall design. 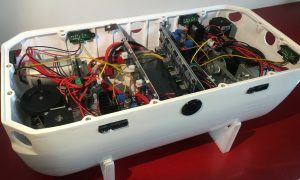 The vessel is designed around two propulsion units, called Schottel Drive II from Graupner. The low level computing power comes from a Arduino Mega and the higher level computing is being done by a RaspberryPi3. 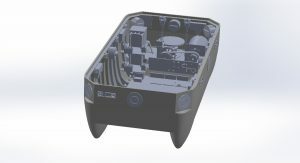 All design of the vessel is done by myself in SolidWorks, ranging from drawing of existing parts to developing the complete hull from scratch and the sheet metal parts. 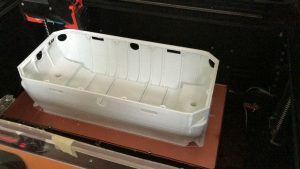 The hull is 3D printed after a very rough start. 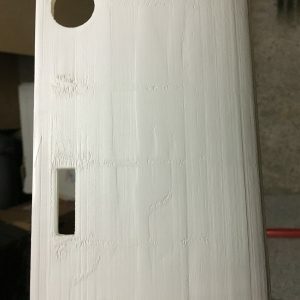 I encountered multiple problems printing a large waterproof product in fairly high resolution. At first I tried to have the vessel printed by external companies. Although most companies were confident on being able to print the hull in good quality the results were appalling. See a few of the products I received from different companies (not to be named). 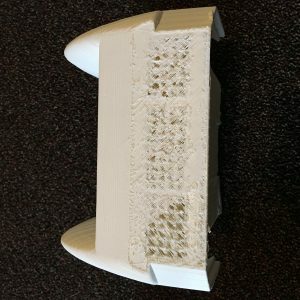 Somewhere within the printing the product has shifted resulting in separated layers, finally resulting in a mesh of wires. 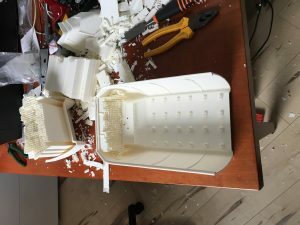 The second product I received broke in half after trying to remove all the inside support material. One had a horrible surface finish. Another I got had a problem with filling up the surface and therefore there were holes in it, not being waterproof was one of the obvious problems with this print! Another I got had a very strange build of the sides of the vessel. It more or less was waterproof, but quality was not perfect. 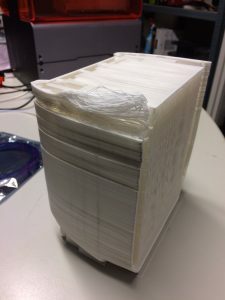 Similar to ordering prints from external companies I bought a printer capable of printing the full hull in one piece. 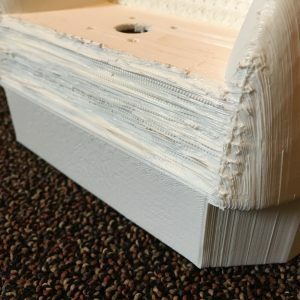 The company helped me with the printing and was able to deliver one hull in good quality (with a printing time of almost 100 hours), unfortunately this printing debacle costed me about 6 months before I got 1 usable print. After that I needed 4 more. But sadly the company that provided me with the first print was not able to reproduce this more than once in good quality. 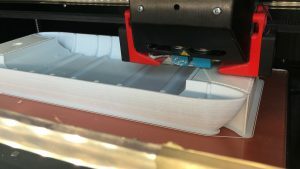 Then I started to try to print this hull myself. After a about a month and many hours waiting for the printer to produce a test pieces I got a print that was good enough to reproduce. 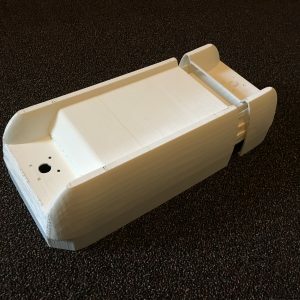 The hull has been printed with PetG with a layer thickness of 0.2 mm and took 38 hours to print. I used PLA as support for the overhanging surfaces. I added an epoxy coating to the outside surface of vessel to it smoothen out. 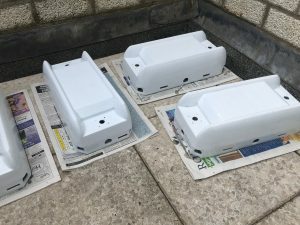 After sanding the hull has been painted with special waterproof boat lacquer. The result is very satisfying. The front and back of the vessel is the same (mirrored). It has two schotel drives to be able to move in any given direction (even able to rotate around its center). The schotel drive is a propulsion unit that is able to propel the water in 180 direction. I changed this part so we are able to rotate it 360 (actually unlimited). I used a steppen motor and a DC motor respectively to rotate and the propellor. There are a few sensors detecting speed and power used. 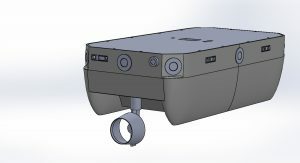 To fix all the part I designed a sheet metal part. This part has been laser cut at the University from 1.5mm aluminium. Two subassemblies inside the vessel. 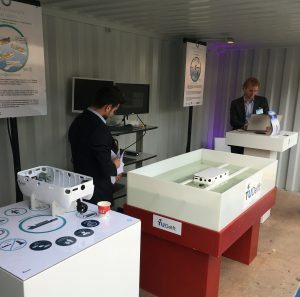 One of the demands of the Delft University of Technology is to have the vessel to be as small as possible. I tried to have all components in the vessel and off course without sinking it! 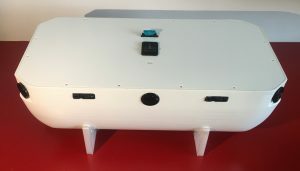 On all sides the vessel has multiple static ultrasonic and infra red sensors, at the front there is one HD camera (e.g. to detect signs or visual commands) inside there will be a HD gyroscope with GPS. All these sensors need to be connected by wires, unfortunately. Although I tried to structure the cable trees and loose wires, for the untrained eye it still looks like a mess. I produced 5 vessels to start filling up a fleet. When the software is ready (done by the department themselves) we are able to fully test the vessel also in cooperation together with the other vessels. The first delivered vessel have been shown on different events. The Delfia has been presented to the Dutch minister of transportation, Melanie Schultz. At the Green Village the Delfia had its own stand. And the vessel has been presented on multiple other events. The first vessel I created was a prototype to validate if the idea was worth developing. This vessel was designed based on a catamaran shaped hull for stability with two 360 rotating propellors. 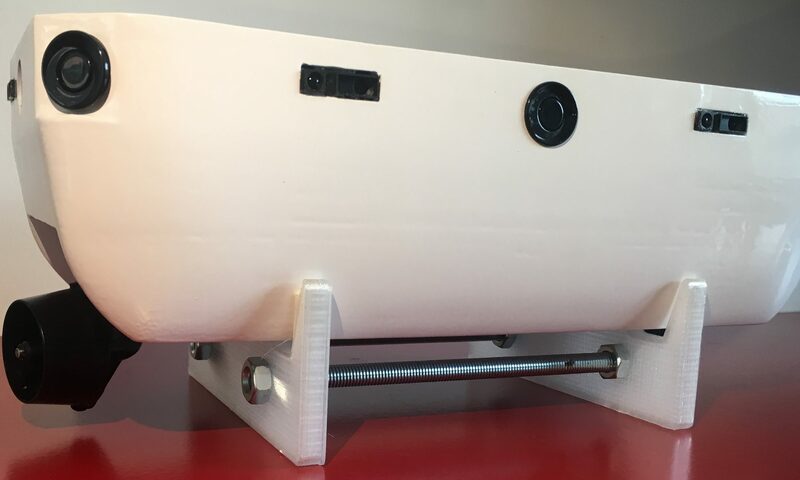 With this prototype the TU Delft was able to test their simple algorithms and the conclusion was clear: the project was viable!